We now have an instagram account! Being a mobile app, you'll need to just search for us on it under dragonstylekungfu. The app now has a short video feature, so be sure to follow us and keep a look out for cool pics and training clips! We made the local newspaper! Check us out in this week's (Wed 27th Feb 2013) edition on page 12! Major props and credit to our entire team who busted their guts performing all day 16th and 17th February for the Lunar New Year celebrations! It was a fantastic experience for all of the 25 member team with only a handful who have never lion danced before! Check out our Facebook page for plenty of photos of both days. Click Here! Classes are over for the year! And what a year it has been. Moving from West Ryde to Cabramatta in February, competing in our first San Shou tournaments, participating in the dreaded Tough Mudder in September... Big achievements and many new students and friends made along the way. Here's to an even better 2013 Year of the Snake when we introduce our new lion dance team! Watch this space. Classes resume on Wednesday 2nd January 2013. Sunday 2nd December 2012 marked our first official End of Year/Xmas Party for the club. It was a beautiful day for our BBQ at Lizard Log in Western Sydney Regional Park, with great food and company! 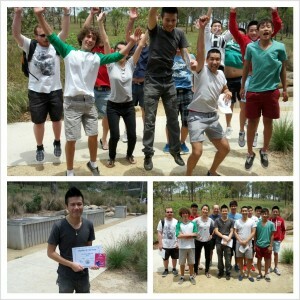 An even bigger congratulations to our Student of the Year 2012 to Sean Ly, scoring himself a $30 iTunes voucher! Sean is our inaugural winner, demonstrating many key attributes all our students can look up to. These include training hard and trying his best each and every lesson, working well with all students, and carrying himself with respect and humility whether it be in sparring or conversation. A big Thanks to all our students and supporters in 2012. It has been a great year of training, making new friends and bonding together over a mutual love of learning the wonderful art of Dragon Style. Here's to an even bigger and better year in 2013 - Year of the Snake!